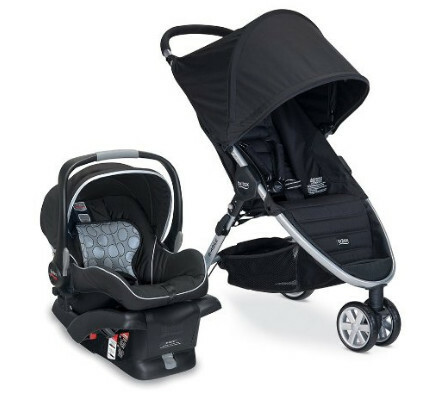 A car seat and stroller combo is not necessarily the same thing as a car seat travel system, although a travel system does require a car seat and stroller combo as one of its components. Even then, a travel system can be built from very different components. A combo is issued as a set, to begin with. Nevertheless, it possible to extend a combo to a travel system, provided the car seat can be used as a carrycot. Find out about the best infant car seat/stroller combos 2017! Much like car seat travel systems, car seat and stroller combos are not very different from standard car seats. In fact, the car seat from any combo set is a standard car seat and thus shares the strengths and weaknesses of such. It is not something exceptional regarding safety. Otherwise, a combo shares the strength and weaknesses of a car seat travel system, except that it is less versatile. The main advantage is that a car seat and stroller combo allows moving the baby in and out of the car without buckling them up and unbuckling them back, saving the time and sparing the baby from the unnecessary disturbance. That is why a car seat and stroller combo is a very convenient set. The main disadvantage of any car seat and stroller combo is that they are only designed for infants who will inevitably outgrow them in a short period. If you have one of those, you know for sure you will not be denied a flight because your seat does not meet the legal standards or the company’s own regulations. This is why proper child restraint system use is strongly advised. 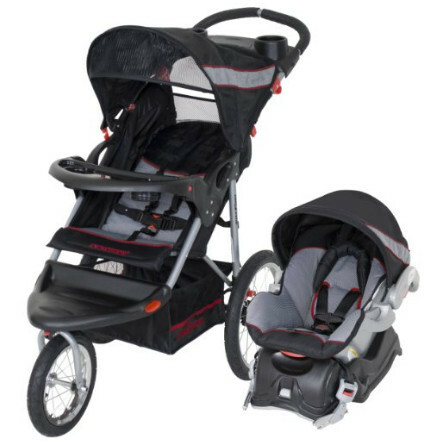 The Expedition LX combo comes with the Expedition 3 Wheel Jogging Stroller and the Flex Lock 5-30 pound infant car seat. As the name implies, the Expedition Jogging Stroller is suitable for jogging. However, this option is not to be used until your child grows up a little. Thanks to the lockable front wheel, the stroller is extremely maneuverable. All three wheels are equipped with all-terrain tires. It also comes with a parent tray, a child tray, and a large storage basket. The stroller can accommodate children up to 50 lbs and 42 in tall. Regrettably, it cannot be folded up unless the seat is reclined. The Flec Lock, on the other hand, is a little more limited than that, only good for children between 5 and 30 lbs and up to 30 inches tall. The 5-point safety harness is something that is a given for most car seats. The Flec Lock also features energy-absorbing foam for side impact protection for the head. All in all, the combo would cost you above average. Some might find the price somewhat inadequate since the stroller is not as well-designed as it might seem and is made of cheap materials. 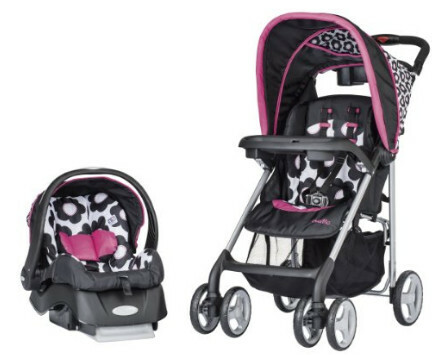 The JourneyLite combo comes with the Embrace Infant car seat and the JourneyLite stroller. The stroller is not overly complicated. It has a 5-point harness and a one-hand fold mechanism that takes only a second to work. It is worth note that the stroller is capable of standing when folded. In a similar manner, the wheel locks only require one move to utilize the brakes and prevent the stroller from rolling. 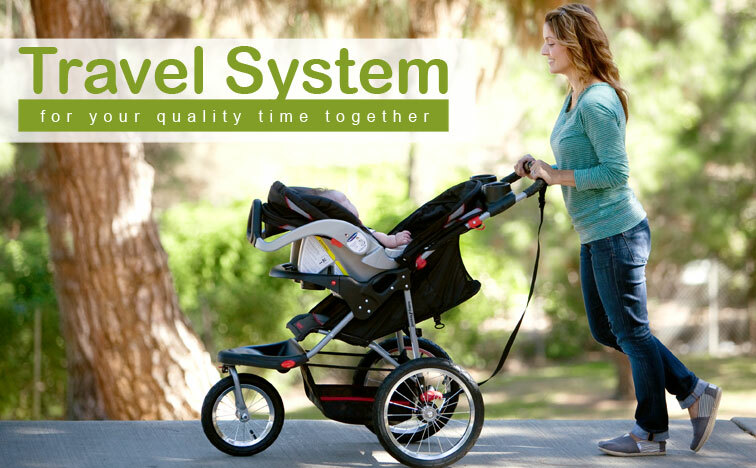 The JourneyLite stroller is also equipped with a child tray, a parent console, and a storage basket. It is ultra-lightweight, and it can accommodate children up to 50 lbs. The canopy has a peek-a-boo window. The Embrace car seat comes with an adjustable base, 5-point harness, and 3 shoulder harness positions. It is capable of accommodating children between 5 and 32 lbs. 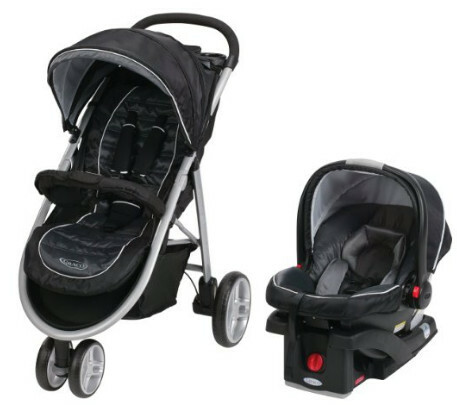 The main advantage of this car seat and stroller combo is its relatively low price, even though it is above average. The car seat is a very basic one, although the stroller does possess some less orthodox features. The B-Agile and B-Safe car seat and stroller combo comprises the B-Agile stroller and B-Safe car seat. Unlike many other combos, this one has been designed as a single set, the stroller and car seat meant to complement each other. The combo comes with the integrated Click and Go system that provides an easy connection. The stroller is lightweight but it is, however, not easy to steer one-handed, although it is definitely possible simply to move it with only a single hand since it weighs only 16.5 lbs. Nevertheless, the B-Agile can accommodate children from birth and up to 55 lbs. It is also very easy to fold. Much like the car seat, the stroller comes with its own 5-point harness. It is also equipped with a large canopy that has a mesh ventilation window. The B-Safe car seat meets all the safety standards, being on par with other Britax car seats. It features side impact protections, as well as rear impact protection, and EPS energy absorbing foam. It can be put in place with LATCH connectors. It can accommodate children up to 30 lbs. The combo’s price is above average. However, despite the price, the combo is very stylish and comfortable for the child, being at the same time convenient for the mother. The car seat meets all the safety standards. Much like custom travel system from Graco, this combo utilizes the ClickConnect 35 system. In fact, the car seat is the SnugRide, the seat that has been recommended for building car seat travel systems. The car seat can accommodate children from 4 to 35 lbs. It has been crash tested and verified to meet all safety standards. The Aire3 stroller is very lightweight. It also features an easy fold that requires only a second to complete and a multi-position stroller seat. It has three wheels that make it easier to steer. It performs greatly on any terrain, running just as smoothly. The stroller is also equipped with brakes. For convenience, the stroller features a parent’s tray as well as zippered storage and an extra-large storage basket. The main advantage of this combo, other than the safety features, is the maneuverability and the light weight of the stroller. It is capable of very smooth ride on almost any terrain, as well as easy to steer. It would cost you far above average. 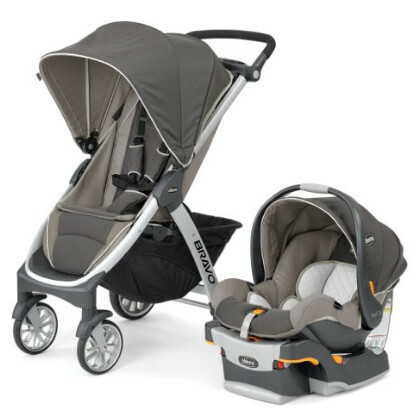 The Bravo Trio stroller and car seat combo comes with several features either not present in many other products or limited to very few of them. The Bravo stroller features a removable multi-position reclining seat, a one-hand fold, a removable and adjustable canopy, a height-adjustable push handle, linked rear brakes, all-wheel suspension, and a parent tray, to say nothing of the KeyFit attachment that allows to click a car seat on, that is a given for any car seat and stroller combo. The KeyFit seat, on the other hand, is a perfect solution as a car seat. It meets all safety standards. The seat is lightweight and offers perfect protection. The combo is rather expensive as far as combos go, however, t is very comfortable for the child, convenient for the parents and rather easy to use in general. It would cost you a very considerable sum of money. Please note that, while expensive, the seat is one of the safest seats in the world, and it is not only the seat that you get. The stroller is a valuable purchase in its own right.